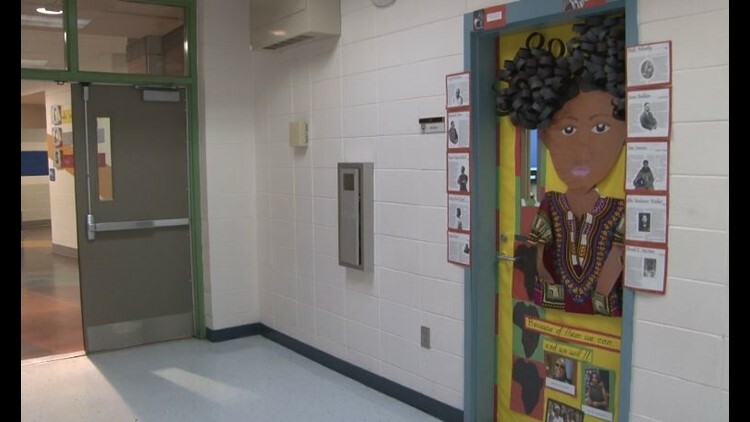 This teacher went above and beyond to celebrate African American history with her students! MACON, Ga. — Miller Magnet Middle School teacher Marcia Waller found a way to make Black History Month special for her students. At the start of February, Waller put an elaborate decoration on her classroom door. Waller's door is difficult to miss. It depicts an African American girl with 3-dimensional curly hair and a dashiki. The door also features photos of black historical figures and quotes like, "Because of them we can and we will!" When Waller posted a picture of her door on social media, it got an overwhelming response. "It was shared and shared again and shared again," said Waller. "It's reached over 4,000 likes on Instagram and Facebook." Kai Frazier, the CEO of educational virtual reality company Curated x Kai, saw Waller's door online and decided to gift her class with their own virtual reality headset. The headset is on its way, but once it arrives, students will be able to go on virtual field trips through the solar system or the Martin Luther King Jr. Memorial in Washington D.C.
"I'm excited to get the virtual reality headset so that we can take our field trips and I owe it all to this door," said Waller. Frazier looks forward to seeing her kids learn more about African American history in a new way.